A wry grin widens on Zac Haynes’ animated features as he explains the intricacies of the Western Australian summer sea breeze to me, which at this moment, just as we are biting into the first sandwiches of our lifeguard shift is spinning around the quadrants in front of us. A ‘whirly whirl’ daemon from the southwest announces it arrival through the arbitrary selection of a holidaying families parasol; whipping it up twenty feet into the air and depositing it threateningly close to a child building a sandcastle adjacent to our patrol flags. The flagpole begins to bend like a flamethrower impaled in the sand. The now crying child is quickly embraced by parents, a tragedy averted, the beach crowds will disperse along with the arrival of the breeze. Part-time Lifeguard and committed big wave surfer – 21 year old Zac Haynes with his shoulder length mullet epitomises the hard working surf crew here in Margaret River, three hours ‘Down South’ of Perth. Choosing not to be defined by his day job or his get-up, but by the waves he can catch before the sea breeze ends play. Big period, ‘Roaring Forties’ swell, delivers the goods here on an almost daily basis, even through the long summer months. Flat is three foot and three foot requires a pintail. This land is not easily definable, a contrariety of harshness and delight that does not blend in equal measures. 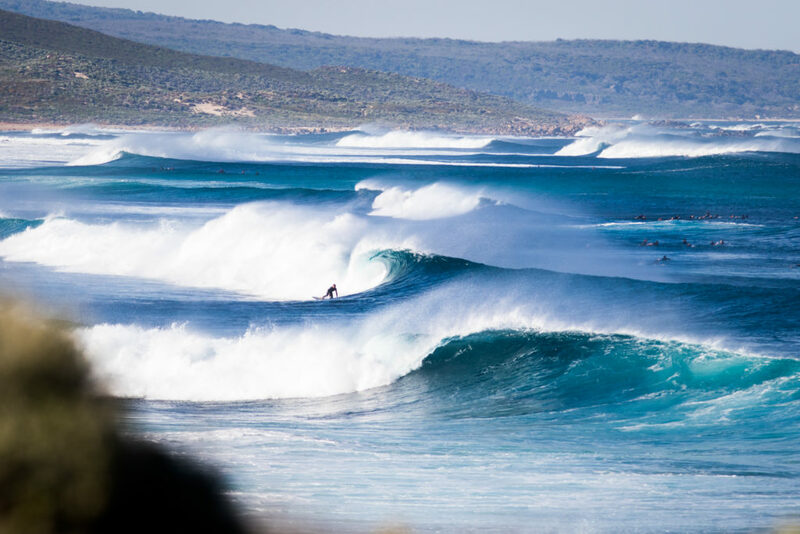 Majestic Karri trees, atmospheric caves and civilised vineyards line Caves road, which can lead a well informed surfer to dozens of world-class surf spots dotted along its 135km length. Yet, beneath the glossy tourist veneer an alternative narrative co-exists. The occasional white cross warning, crudely spray painted onto a specific tree, denotes a traffic death. Caves road doesn’t take prisoners. Its beauty and danger defined by an idyllic frame of native hardwood. Likewise, an untimely accident at one of the infamously named surf breaks framed by gneiss granite, jagged limestone or compacted sand can result in a similar fate. Flying into Perth, I’m struck by how big the Indian Ocean looks when compared to the city, a colossus of nature butted up against a city as big as the palm of your hand. As you get closer the starkly artificial green and blue terracotta tiles of the suburbs beam up at you, reflecting the unrelenting glare of the southern sun. The lives, dreams and worries of over two million people, condensed into a palm sized microcosm. Closer still, swimming pools begin to dominate the view, a myriad of chlorinated pools as far as the eyes can see. Squinting as the plane banks into the sun, I envision the manmade landscape as a moorland, joined by lochs of glistening pools, a network of ruler straight, fissure like roads and occasional pinnacle of hardened steel. West Australians are incredibly proud to proclaim the virtue of their dry, hot summer climate. It is of course, a one trick pony. Much like the economy of the state, a house of cards built on the clearly flawed assumption that the land contains an unending supply of mineral wealth. Newcomers to this land will learn quickly that it is better to indulge locals than to disparage such claims. One can only presume a sunny outlook on life is essential when a beer costs around $12 AU. Growing up in the frequently changeable climes of Cornwall, I find it more natural to describe a climate by its flaws and occasional magic rather than its unremitting consistency. However, when things are steady, change is often the harbinger of trouble. Bush fires (the State’s worst for fifty years) rage across the Southwest towns of Waroona, Harvey and Collie – forcing the closure of summer music festival in the Southwest. Disgruntled punters bemoan the decision, further cursing a highway diversion causing three hour delays from Perth. Others lose their homes, a few will lose their parents. Back in Dunsborough a tourist town 45 minutes north of Margaret River, panic buying grips the town. Yesterday holidaymakers were pre-occupied with holiday shopping, now the same people jostle for fuel in an articulated, infinite loop of SUV’s snaked between the two petrol stations in town. The supermarket runs dry of milk. The beaches covered in a post-apocalyptic haze, clear of the hustle and bustle of peak summer, leaving a few dog walkers, and occasional surfer appearing and disappearing into the gloupy murk. The bush is illuminated by ethereal tones of shimmering silver and lavender, no need for instagram filters here. Later that morning I catch up with my old housemate Brett for a surf in Margaret River, now working on the mines as a ‘Fly-In-Fly-Out’ worker up in the hinterlands of the northwest. A structural architect by trade, he explains to me that his new role involves checking fire hydrants on the site known as ‘Cloudbreak’ on a two week on, two week off roster. It seems an especially cruel twist of words that a mine is named after a tropical surf idyll – especially as so many of the workers have been lured away from the regions bountiful waves to tap into an entirely financial power source. Its very name serving as a constant reminder of what one has sacrificed to service families, homes and consumer goods. The effort of the lengthy walk over soft sand in the smoke laden air, dissolves into our free-flowing and rapid paced conversation, as only that of good friends who haven’t seen each other in a while can. 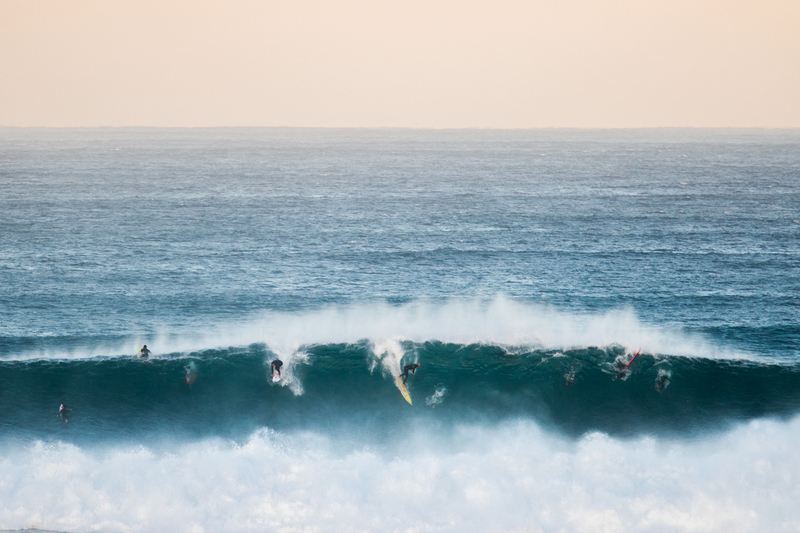 Arriving at the hallowed beach break peaks of Boodjidup, we are greeted by a smallish swell, others will be seeking more size – this is an area normally crawling with tubular devotees. 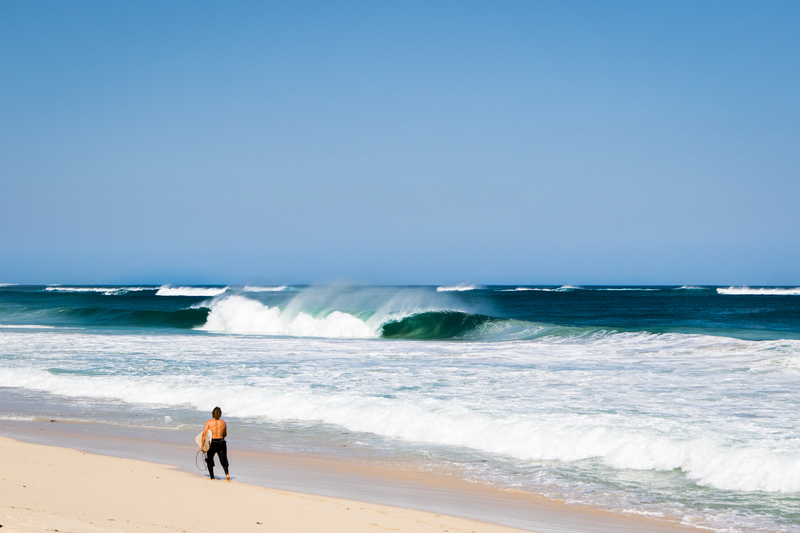 We find an empty shoulder-high left peak, the waves stand up brusquely on the shallow bar and quickly exhale two second tubes into a small rip. A short and stout session unfolds, banter and shots, no tavern required. A small white rental car, occupied by a holidaying couple moves cautiously down a wineries meandering drive, past a sign firmly asking ‘WHO IS THE SKIPPER?’. Looking once, then twice to be extra careful (two glasses of Chardy with lunch, or was it three?). 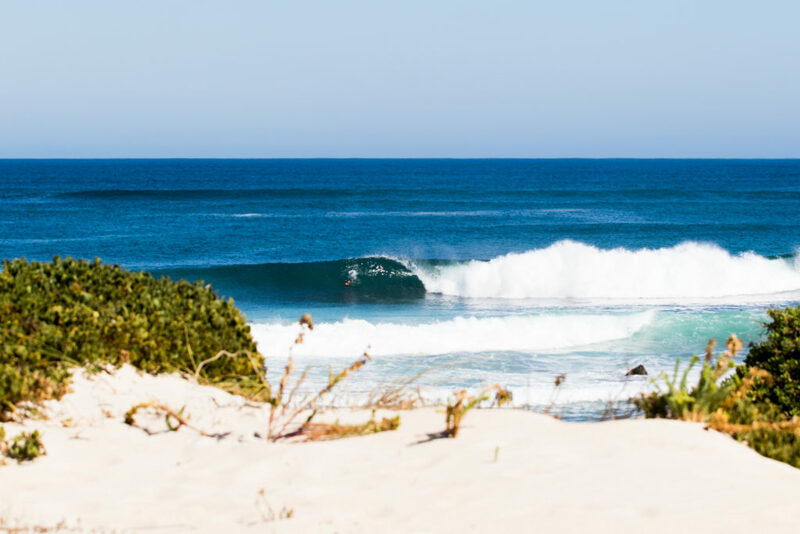 They inch out onto Caves Road, whilst a beaten Land Cruiser full of young surfers eager to explore the mind altering alchemy of mixing groomed swell with limestone reefs screeches round the bend. The Surgeons Table, Gallows, Guillotines, The Womb – The abundant and wonderfully named limestone reefs each provide their own unique variation on the same theme. The names and experience an affirmation of life and death. 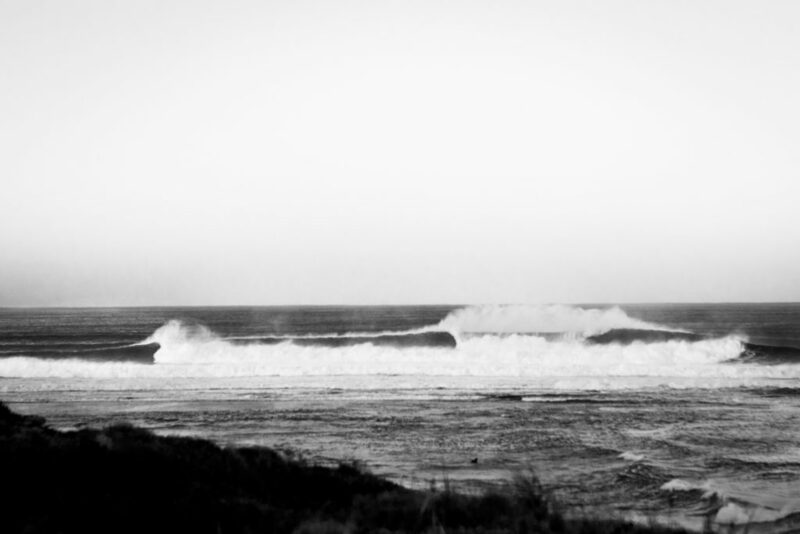 Lefts and rights, long and short, hollow and more hollow. To each man his own, each square inch doted by a regular group of limestone disciples. Anglo-American poet W.H Auden also adored limestone, the way it eroded was of particular fascination. Limestone’s solubility in water means that the fault lines in the original rock get slowly deeper by the process of liquid and wave wear. In that, limestone is determined by its original flaws. For Auden this was a human as well as a geological quality. He found in limestone a honesty, an acknowledgement that we are defined as much by our faults than our substance. Locals round these parts will tell you that the South West is ‘God’s Land’. This is not a nod to religious fervour, but rather, a self-affirming declaration of abundance. A land of milk and honey. But if one looks just beneath the gloss, it is in the fault lines and flaws that the true beauty, grit and elemental honesty of the region can be found. A carbonated concoction of land, wind, fire and water. Photos by @lugarts unless otherwise stated.